We begin with our yummy Pumpkin Cupcake fragrance, topped with a whipped layer in the same scent. 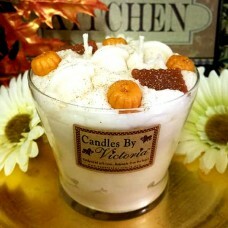 We than garnished this sweet Fall inspired candle with wax pumpkins, cupcakes and graham crackers. Poured up in our favorite Love, Victoria jar our new Love, Victoria Bake Shop line is just to cute!! With over 18 oz. of scrumptious wax these candles will give you hours and hours of enjoyment!